WiFi. Transfer only? Then download the Bansko App for your transfer, or car hire. Worth €5.00; one for every person in your group. 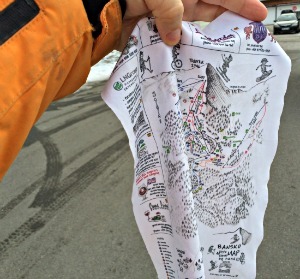 Printed with the Bansko piste map, by hand. Perfect for cleaning glasses and goggles. FAQ’s. Read them first please; click on “Can we help?” chat or click contact for assistance. You Say and Bansko App for testimonials on Bansko Blog services. Save money on a 6 day, 9 day and 13 day lift passes. Lift passes include piste mountain rescue insurance. For gondola cash desk 2015/16 prices click here. Need a pass for 7 days or more? Pre pay here for a 6 day pass and buy extra day(s) lift pass in resort at gondola cash desk. Note: All travellers to Bulgaria must have comprehensive insurance covering off piste, in resort and medical care and repatriation. Check your policy terms and conditions carefully. Sofia - Bansko – Sofia All prices are for return journey; 170 km each way. Insured and fully regulated service. Free WiFi on your transfer service is subject to availability. Transport direct to your Bansko, Razlog or Dobrinishte accommodation. FAQ’s Not sure what to book? Your questions not answered? Go to contact and send me an email. Click on the online booking tool with all the fully discounted prices. Complete the online form with your exact requirements, checking dates. If you prefer to pay in €EUR or $US, indicate in comments section on booking form. Check your order carefully and click submit. Wait up to 24 hours for your payment request. Print your confirmation of payment and take to shop. Ski Hire & Ski Lessons 2015/16 online booking. Go to online booking form for best deal. Other services arranged: helicopter rides, horse riding, mountain biking, visits to special places of interest. Contact us for your own bespoke tour that offers you the best that the region has to offer.